"Our personal footage of a dearly beloved rooster." Dear United Poultry Concerns, We love your work and thank you from the bottom of our hearts. We have recently developed a short film using personal footage of a dearly beloved rooster, who in infancy was much more fragile than his siblings to the extent that his survival was in question. We wanted to submit this short film depicting his convalescence through human love and friendship while promoting the merciful and loving treatment of chickens and roosters for your organization's review. The video may be seen here: Our Beloved Rooster. 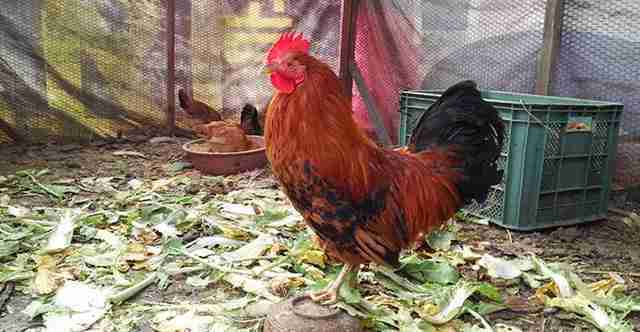 Somang and Damien UPC: Please tell us your rooster's name and send us a photo of him now, all grown up. View a short video: Aegi Today. My rooster's name is "Aegi," meaning "baby" in Korean. First I called him baby because he was so little and weak and he really was a baby. I still call him "Aegi" because he is so lovely and he will be forever my baby. The artist for whom I developed this video is also a vegan and loves animals. We are so happy that you like the video. Please feel free to use it in any way which can support your great cause and work.